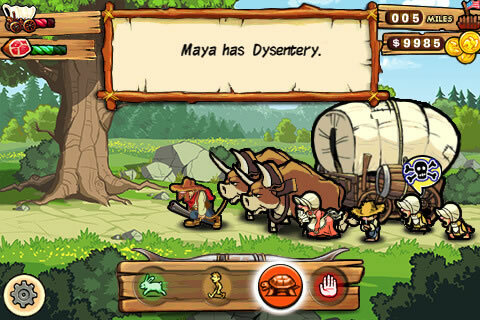 The original The Oregon Trail was released in 1971. If you have a hankering for the Apple II version of Oregon Trail, you can play it online--with old time graphics and sounds--at Virtual Apple 2. Students probably won't appreciate the ancient-looking game. The original version has a lot of text and unimpressive graphics. Westward, Ho! Your favorite pioneering adventure game is back and takes you to an exciting, historical side-scrolling adventure entirely rethought to fit the Touch experience of your iPhone / iPod touch. All of the decision-making and problem-solving fun of the original game, plus additional parameters to take the Oregon Trail experience even further than you've played before. 8 skill-based mini-games, including 2 accelerometer-based challenges: hunting, fishing, river crossing, rafting, wagon repairing, telegraph, berry picking, and gold panning. Random events (disease, bandits, hitchhikers, etc.) faced by real pioneers increases the challenge. Side-missions add more excitement to your journey, affecting your westward trek. Prepare for your departure: Select the members of your party, choose your departure date and purchase supplies. Oregon Trail shares information like what clothing to wear, how much oxen weigh, and which is the best seat in the wagon. Of course, by playing students get to practice map skills, conserve resources, and develop a strategy. Teachers using this in school will enjoy teaching students about dysentery (and other historical diseases) as well as having students compare the game to the real struggles pioneers had traveling across North America. Oregon Trail is getting rave review in iTunes. I've had a blast playing it and I know youngsters who were born after the 80s will too! Besides Oregon Trail, the there's Westward in the App Store. This $5 game is a strategy game where you "control the destiny of the Wild West by building thriving towns, exploring uncharted plains, dense forests and rocky canyons and guiding settlers to safety and success." Westward is rated 12+ for mild profanity, fantasy violence, and tobacco and alcohol references.